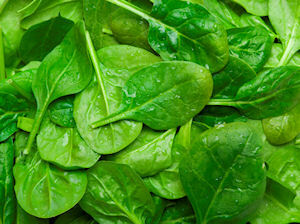 This is a great way to jazz up plain old spinach and make it into something special. Serve it up with BBQ chicken, BBQ corn and a big salad for a delicious family meal. Stem and quarter the mushrooms. Finely mince the onion and mince the garlic cloves. Heat the oil in a frying pan and add the onion and mushrooms. Cook for 5-7 minutes until softened slightly and browned. Add the spinach and garlic. Cook for another 5-7 minutes until the spinach has wilted. Season well with salt and pepper. If you cannot find fresh shiitake mushrooms, use fresh wild mushrooms or chestnut mushrooms. This recipe serves 2.